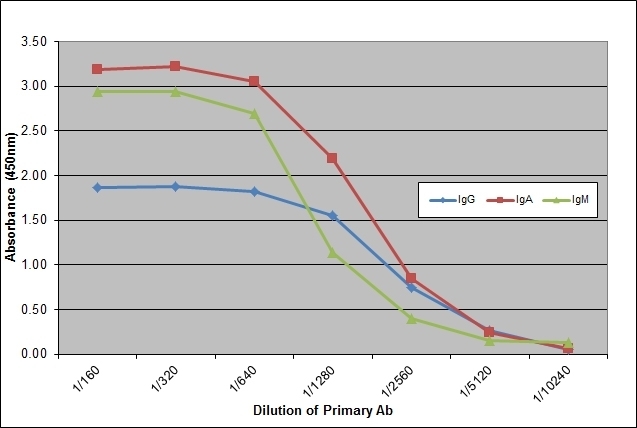 Purified Canine IgG, IgA and IgM detected with Mouse anti Dog IgG/A/M (MCA630GA) followed by Rabbit F(ab')2 anti Mouse IgG:HRP (STAR13B). Mouse anti Dog IgG/A/M, clone K99 2E3, recognizes canine immunoglobulin (IgA, IgM and IgG classes). Tipold, A. et al. (2000) Presumed immune-mediated cerebellar granuloprival degeneration in the Coton de Tuléar breed. Altug, N. et al. (2010) Immunostimulatory Effects of Aloe vera and β-Glucan on Cellular and Humoral Immune Responses Following Vaccination with Polyvalent Vaccines in Dogs.